If I were on Jeopardy and I chose "Boxing for 400" Alex might say to me, "In the late 1800's this country was home to The Boxer Rebellion." At which point I would be like, "Oh shoot, I think I've heard of that?" and Ken Jennings would be like "What is China." But not anymore! Now I'm probably never going to forget that! 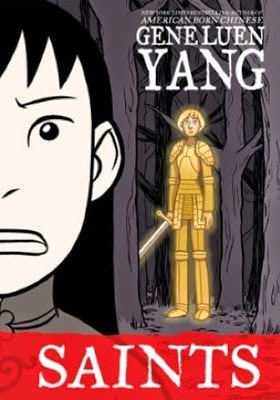 I just finished Boxers and Saints, these two graphic novels about The Boxer Rebellion in China by Gene Luen Yang. 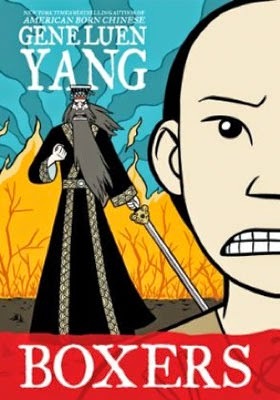 They were really, really well done, which is what I've come to expect from Gene Luen Yang. Boxers follows Little Bao's journey from small-town kid to rebel leader. Saints follows Four-girl's life and conversion to Christianity. Both Four-girl and Bao receive visitations from spirits within their religious traditions. Both of the books are awesome. However, I didn't expect them to be quite as somber as they were. I mean, the tone of them is perfect, don't get me wrong. They should be dark; they are companion books from each side of a war. The subject matter is heavy but kept appropriate for 14+. If the books were made into a movie, it would definitely be PG-13. To balance the seriousness of the books, Yang sprinkles in humor. At one point I even laughed out loud. But Boxers & Saints are definitely more dark than America Born Chinese*, and more bloody by far than Level Up. Though they were bloody, I'm thankful the books weren't gory. I mean, there was lots of full-color red blood, but no very realistic looking guts (though there is a head on a pike). The art is awesome and I loved Yang's use of color. Looking back at Saints, I see that it is really only 2 toned, but I thought it was in full color, like Boxers is. Ah! Surprised again. Anyway, the colors really make the spirits stand out from the living. The characters were so sympathetic. I loved Bao and Four-girl. I felt for both of them and to see them sometimes making bad decisions just killed me. It was so apparent that Bao especially is trying to do the right thing, but everybody makes mistakes and oh my goodness there are some doozies. There was nothing I didn't like about this book. I would own it. It surprised me and intrigued me and I feel smarter now that I've read it. The two books should definitely be read together, I think of them as one! I recommend reading Boxers first and then Saints. If you'd like to buy them, you're welcome to use my affiliate links to Barnes and Noble and Amazon , for which I will receive a small commission. What do you think? Have you ever read a story that told both sides? Would you ever read Boxers & Saints? 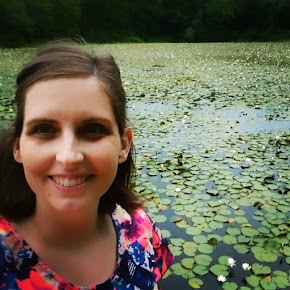 You are still more than welcome to sign up for my newsletter! Thanks, Ashlee dear! These are definitely a good graphic novel! I don't think I knew you were a history major! Very cool. Boxers & Saints would be good as a first graphic novel. American Born Chinese (by the same author) was the first one I ever read. My tip is this: Don't forget to read the pictures! :D I mean, reading a graphic novel exercises different brain muscles, a little bit. Of course you know all about that with Neal's being a comics artist. (raisedbymydaughter.blogspot.com -- it's good). You'll be surprised how quickly you read a graphic novel! I love it.